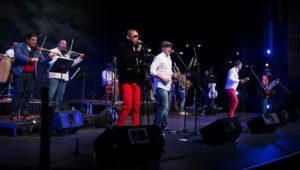 Back by popular demand, this high-energy group is a joyous celebration of Cuban music and dance. The Havana Cuba All-Stars are composed of Cuba’s most acclaimed musicians. With rhythms and melodies from the cha cha to the rumba and the salsa, the All-Stars showcase a wide variety of authentic Cuban beats. With infectious melodies, wailing trumpets, masterful guitars and amazing vocals, the group presents the entire tapestry of Cuban music. This year, the All-Stars are accompanied by three of Cuba’s finest dancing couples. With the greatest dancers and musicians of Cuba working in tandem, the American encore of the Havana Cuba All-Stars tour, will be a spirited spectacle of song and dance, exemplifying Cuba’s greatest musical traditions. For Tickets and Info: www.visitqpac.org or call 718-631-6311.